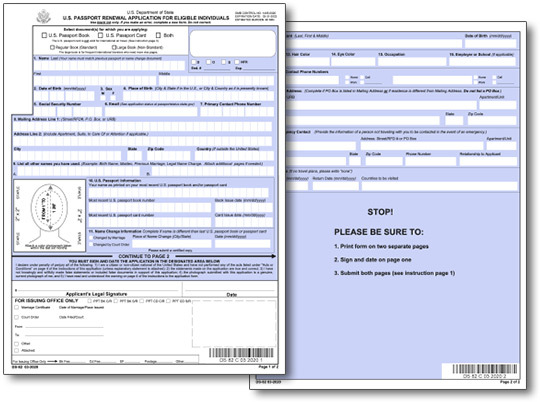 Form DS-82 is the application form required to apply for a passport renewal by mail. The form and detailed instructions can be downloaded below. The estimated time required to complete the application is 40 minutes but most applicants finish much faster. Renewing a passport by mail is not allowed if it is significantly damaged or was issued to a minor age 15 or younger. Also, it is not possible to renew a passport that was issued more than 15 years ago. In such cases, the applicant needs to apply for a new passport by submitting Form DS-11 at an application acceptance facility rather than completing Form DS-82. Click here to expedite your passport renewal in 2 weeks or less. Choose the folder where you want to save the form. Alternatively, you can complete the application for a us passort renewal online. Some applicants have reported connection problems or errors when trying to enter data online. If you have difficulty completing the online passport renewal form, download Form DS-82 and complete it offline. How do I fill out the US passport renewal application? The first section requests personal information such as full name, date of birth, place of birth, gender, social security number, email address, primary contact phone number and mailing address. There is a place to attach your passport photo and input the date about your most recent passport book or passport card. The last item on the first page is a space to input name change information if it applies to you. The second page of Form DS-82 has spaces for you to include your height, hair color, eye color, occupation, employer or school, additional contact phone number, permanent address, emergency contact and travel plans. If you do not have any immediate travel plans, you can leave the spaces blank. It is very important that you follow the instructions carefully. Any errors or illegible writing can lead to delays in processing time and complicate your travel plans. It is always a good idea to check everything two or three times before mailing in the completed passport renewal form. How long does it take to process the renewal application? Standard processing can take up to 6 weeks. This is an estimate. It could take less time just as it could also take more time to complete. Expedited passport renewals by mail usually take between 2 and 3 weeks to process from door to door using overnight delivery both ways. Applicants who need to get passports renewed more quickly, should arrange to visit a regional US passport agency or, in the event the agency has no opening prior to your depature date, employ the services of an express passport expediter. Need to renew a passport fast? Apply online for expedited courier service in 24 to 48 hours:Expedite My Passport Renewal Now! Do I need to fill out Form DS-82 to my renew passport in person? Question: I need to renew my passport but I cannot wait 6-8 weeks. I am going in person to a same-day service. What do I need to bring? Can I put 2 passport renewals in the same envelope? Question: I would like to put my husband's and my own passport in the same envelope. Do they need to be mailed separately? Where should I send my passport renewal application? Question: The provided address is a PO box. I need a physical address so that I may send it through FedEx or UPS.